Almost 7 months after breaking 3,000 members, Richard's Animorphs Forum has crossed another milestone today; 4,000 members. 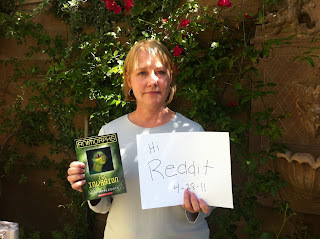 This figure is huge for a series that was teetering on death; hopefully with the Animorphs re-release just days away, we will welcome many more Animorphs fans; new and old. Earlier today, Animorphs author K.A. Applegate surprised popular social-news website Reddit readers by posting the above picture, and initiating a question and answer session; similar to the ones we were granted in the past (1, 2). Visit the link here. Or discuss KA's initiave here. 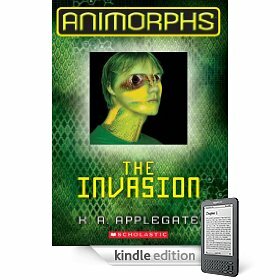 Years after members of RAF completed the RAF Animorphs eBook Project, it seems that Scholastic has, along with the relaunch of the Animorphs series, decided to release eBooks as well. So far only The Invasion (the first book in the Series) shows us as being available via eBook format on the Amazon Kindle Store and Barnes and Noble Nook Store. The book will be available on May 1, 2011. Thanks to Hirac Delest as always for up to date news. Hey, kids! It's time for another round of KitsuneMarie's RAF Social Column! The inevitable anonymity of strong internet communities such as RAF can often lead to curiosity about fellow forum members. A particularly prominent RAFian, Essam 293, was awarded Ani-Master of the Year in 2010 for his superior knowledge of Animorphs. But how did he come by such sagacity? What drives his personal obsession with Animorphs? And perhaps most importantly, what is his favorite snack? Essam generously allowed me to interview him regarding these critical questions. Enjoy! How did you first learn about Animorphs? How old were you? I was 12 in 1996, and the first book I read was Animorphs #1. It was near the end of the school year, and I think the first 2 books were already out at that point. There was a book fair at my elementary school, and there was a rep who sat our class down in the library to go through all the new books and series that were coming out for the summer. Animorphs, of course, was the only series that really stood out to me after she was done. It was pitched to our classroom as "Some kids find a dying alien, who then gives them the power to change into any animal". I remember immediately getting up and looking for it after that presentation, and then following every single book release until the end of the series. What made the books so compelling for you? There were many things that the Animorphs series did just right, but it hooked me in the start as the ultimate underdog story. The characters were told right away that their only chance was to survive. Not win, but to survive long enough until the real help actually arrived. And then by the end of the first book, they were already one soldier down. So right away it was the most epic thing I had ever read as a kid. Second, it had characters I could relate to-- Kids my age with regular chores, too much homework, and a love for movies and video games, who were then placed in a situation (no matter how fantastic) that I could very believably place myself in as a reader. What really sold me on it though was that the kids were never perfect, and that the series made a point in making sure we knew this. They didn’t have costumes, and the books never treated their mission to save the world as every other Saturday morning cartoon. These were kids who were fighting a war. They made mistakes, they got scared, and they felt the consequences and emotional scars of the violence they were thrown into. And while on the most part they did survive most missions, they very rarely ever actually won or left unscathed. So there was this very believable and grounded element to the sci-fi threats they faced that also hooked me to the series. Up until that point I had only been reading Goosebumps, or other ‘scary’ kids spin-offs, but none of them had characters or stories that really connected with me any way. Animorphs, however, not only managed that, but also dealt with a great number of important issues involving slavery, genocide, and warfare as the series progressed. I never felt that the series talked down to me in any way, or that it shied away from a topic to what these kids really would really have had to face through. Behind the colorful covers and superhero-like elements, it was unlike any other ‘kid’ story I had ever read, opening my eyes to all kinds of situations and questions-- Questions that didn’t necessarily have a black and white or right and wrong answers, where not every side necessarily even had ‘good guys’ or ‘bad guys’-- just people who had really good reasons for what they were doing. So I guess it’s not surprising that books like #19 and Hork-Bajir Chronicles are some of my favourites in the series. I probably learned more about animals and morality in Animorphs than I ever learned (in an interesting way) in any elementary school classroom I ever had. The series will always hold a special place on my bookshelf because of this, and I’m forever grateful to Katherine and Michael for writing a series that didn’t just entertain me as a kid, but made me think too. Tell us about Hirac Delest. What is it, when did you start it, and what gave you the idea? Hirac Delest is an Animorphs archive. The actual name of the site is a term that is taken from Andalite Chronicles, and it’s purposely chosen because its definition extends quite well to the site’s mission, which is to set out and collect the whole story, and every bit of information regarding the series. I started it over 3 years ago when I decided to go back and look the series up again. I was surprised to find that very little was left active from back when the books were still coming out. There used to be hundreds of active fan sites and now there were almost none. The information was completely scattered, along with the fan base. The only place I really found with enough activity were places like RAF and LJ, and I was surprised to find that there were also a lot of new fans that had started reading after the series was over as well. So the idea came from there, where I wanted to create a place for older fans to reminisce about the series, while new fans stumbling onto the books could find answers as well. Hirac Delest is a source of Animorphs news for a lot of fans. How do you stay up on what's going on? Michael and Katherine are very cool people, so they get in touch with me every so often when there is something they want to share with the fans. But in most cases, I just keep my eyes open. For the relaunch, I make routine checks on various places online, and look for little details that many people may not regularly keep an eye out for. It also helps that we have some pretty fantastic and loyal fans for the series. As I said above, the archive project itself could not have been as comprehensive as it is now if it weren’t for these fans, so most new visitors to the site see the amount of effort right away, and are then willing to share more towards it because of this. I suppose this is the biggest reason why the site has gained enough of a stance in the community to be regarded that way as a news source as well. Give us an Animorphs-related anecdote or fact about yourself. What are your thoughts on the re-release? Excited. Definitely excited. I’m looking forward to seeing how it all turns out. What this new generation of readers will think of the series. What the new edits will be. What Scholastic will do next with the franchise. But most importantly: I’m looking forward to getting the biggest nostalgia kick ever when I walk into a bookstore in May to pick up a new Animorphs book. I mean, seriously? A new Animorphs book? It’s probably the closest thing I’ll ever get to revisiting my childhood, sans time travel. Are you in school? Out of school? Working? What is your dream for the future? I’m done school and I have my degree. So I’m currently working, but I’m also looking for something related to my career now. I also freelance on various projects from time to time, so it keeps me busy, and I very rarely have moments when I’m not working on something. Dreams? At the moment: to land a job in something that would equally fuel me in a geeky and creative way. I have skills with a variety of different interests, so I’m pretty open in what direction I want to take while I try to figure things out. Hirac Delest takes up a lot of my spare time (which isn’t a lot), but otherwise I’m usually either drawing or reading. I love video games too, but I hardly ever watch tv or movies as much as I used to because I like to do things that are interactive or creative in some way. Graphic/web stuff especially: I like to try new scripts, designs, and figure out new ideas and methods that I may not already know. How can possibly pick only one kind? I love food! Taste. Aste. Tuh-aste. You've been given a free round-trip ticket to visit anywhere in the world for a week. Where will you go and why? I have a list of countries that I would like to visit at least once in my life time. However I currently live in Canada, but I've never gone outside of Ontario. So I'd start here and visit some of the other provinces first, most definitely with Vancouver, BC. I’ve always wanted to go there. What is your favorite non-Animorphs book/series? The Hobbit by J.R.R Tolkien, The Time Traveler’s Wife by Audrey Niffenegger, The Watchmen by Alan Moore, Scott Pilgrim by Bryan Lee O’Malley, The Dresden Files by Jim Butcher, The Millennium Series by Stieg Larsson, almost anything by Scott Westerfeld (The Midnighters and Uglies series are my faves so far), and very recently I’ve become addicted to The Ender’s Game series by Orson Scott Card. If anyone wants to share favourite books or recommendations, then feel free to follow or add me on Goodreads. 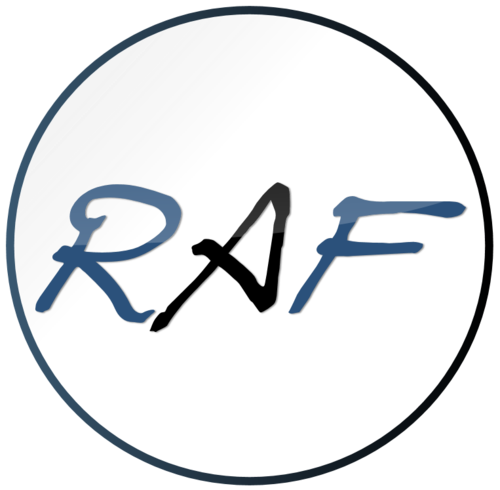 That you can send message Richard if you wish to have anything featured on the RAF Blog?